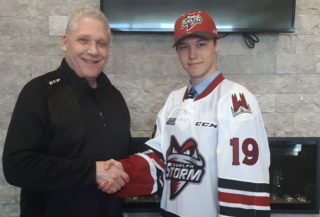 There was never any doubt in the mind of Guelph Storm coach George Burnett about who was going to start in goal against the London Knights Wednesday night. 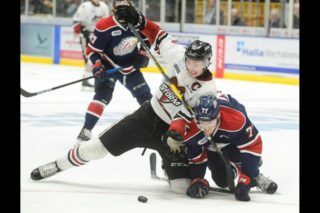 Starter Anthony Popovich had a rough night in Game 3 and some felt with the season on the line Burnett would go to backup Nico Daws in Game 4 against the London Knights. 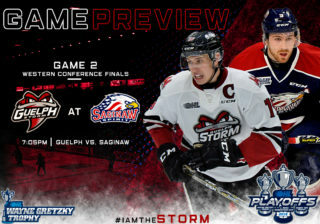 Guelph trailed the best-of-seven series 3-0 and needed to ‘shake things up,’ right? The thought never crossed Burnett’s mind. 1st Period-1, Guelph, Schnarr 3 (Suzuki, Durzi), 4:24 (PP). 2, London, Boqvist 9 (Regula, Hancock), 17:32 (PP). Penalties-served by Stranges Ldn (too many men), 3:51; Coome Ldn (tripping), 12:09; Bouchard Ldn (unsportsmanlike cnd. ), 14:18; Gogolev Gue (cross checking), 16:30; Entwistle Gue (tripping), 19:04. 2nd Period-3, Guelph, Schnarr 4 (Samorukov, Hawel), 4:58. 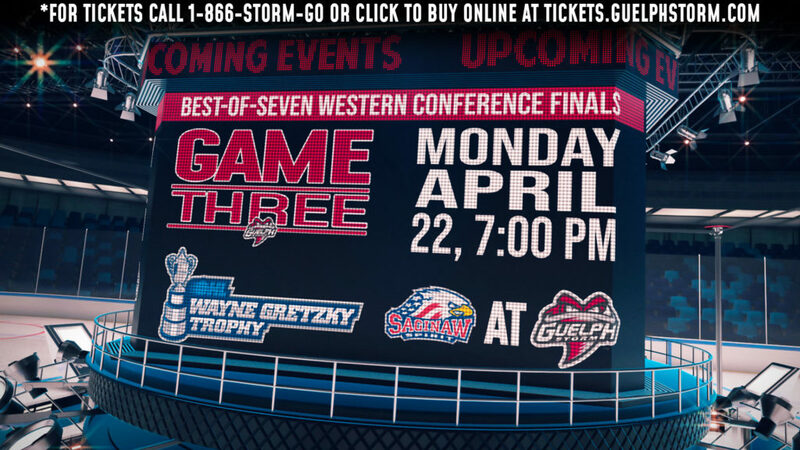 4, Guelph, Suzuki 6 (Lalonde, Entwistle), 5:45. Penalties-Tymkin Ldn (check to the head), 7:39; Schnarr Gue (cross checking), 8:20; Formenton Ldn (unsportsmanlike cnd. ), 19:14; Gordeev Gue (unsportsmanlike cnd. ), 19:14. 3rd Period-5, London, Moskal 2 (Foudy, Bouchard), 0:12. 6, Guelph, Hawel 3 (Gogolev, Suzuki), 14:34. 7, London, Regula 2 (Formenton, Boqvist), 15:18 (PP). Penalties-Lalonde Gue (boarding), 2:55; Phillips Gue (slashing), 15:00. Shots on Goal-London 14-10-18-42. Guelph 10-17-4-31. Power Play Opportunities-London 2 / 5; Guelph 1 / 4. Goalies-London, Kooy (31 shots-27 saves). Guelph, Popovich (42 shots-39 saves).